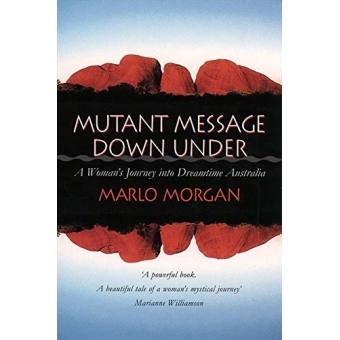 "Mutant Message Down Under" is the gripping fictional account of the spiritual odyssey of an American woman in Australia. Summoned by a remote tribe of nomadic Aboriginals to accompany them on a walkabout through the outback, she makes a four month long journey with the 'Real People', as the tribe calls itself. During this time she learns how they live and thrive in natural harmony with the plants and animals that exist in the rugged geography of the desert region. She faces daily tests of her endurance, and these challenges ultimately contribute to a profound personal transformation. "Mutant Message Down Under", an underground bestseller in its self-published edition, recounts a unique, timely and powerful message for all humankind: that it is not too late to save our world from destruction, if we learn to respect all living beings and to live in harmony with the earth. "The story of a courageous woman who walked with the Aboriginals and learned the wonderful secrets and wisdom of an old, old tribe. Things we all need to learn in our modern society: to get back in touch with nature, to trust and have faith in our inner knowledge and guidance." - Elisabeth Ka Bler-Ross "A powerful message for all of us. I was hypnotised by the simple truths and spiritual lessons. Read it and tell everyone you know to do the same." - Wayne Dyer.